My kids always steal a piece, so they can put the last one in. So nowadays there are always 3 pieces missing at the end of the puzzle. Then the kids have to remember where they hid their "last" piece. 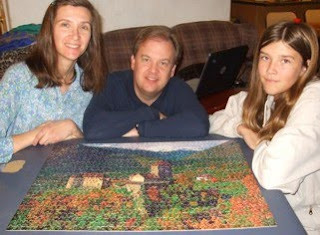 I'm curious for details - what was the puzzle, and is everyone equally interested in making them or do some of the kids get more involved than others? I'm sure looking forward to our up-coming visit! !